"This is the ultimate book for the visual learner. Even for those who initially learn best from simple succinct outlines of high yield facts, will find this book to be the best for the final integration of basic sciences into the art of patient care prior to board examinations or clinical studies. I would recommend this book for every healthcare professional who has some need for understanding how drugs work." 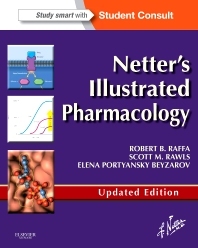 "This updated version of Netter's Illustrated Pharmacology includes new illustrations that accompany Netter's originial drawings. The comprehensive annotated illustrations and succinct accompanying text, never fail to elicit an 'Ah, Now I understand!" reaction. By illuminating the latest developments in molecular biology, cellular physiology and neurophysiology, pharmacodynamics/ kinetics, and complex research findings, it will enhance the reader's basic understanding of pharmacology... As a textbook for healthcare clinicans, undergraduate students, or as an illuminating discourse for the general reader it is superb. The patient/ physician interactions are shown to be a truly two way process, and the axiomatic caricatures of disease presentation will be immediately recognisable. One would like to think that the book will elicitan empathy for both parties that will stay with the practitioner forever."